DENVER — Colorado's marijuana experiment is threatened by the popularity of eating it instead of smoking it, leading the pot industry to join health officials and state regulators to try to curb the problem of consumers' ingesting too much weed. A task force gathered Wednesday to start brainstorming ways to educate consumers, including a standard warning system on popular edibles, which is the industry term for marijuana that has been concentrated and infused into food or drink. One idea was to fashion labels on edible pot like the difficulty guidelines on ski slopes, a system very familiar to Colorado residents. Weak marijuana products would have green dots, grading up to black diamonds for the most potent edibles. "We should have a marking so that when people come in, they know what they're getting," said Chris Halsor of the Colorado District Attorneys' Council. A college student from Wyoming jumped to his death from a Denver hotel balcony last month after consuming six times the recommended dose of a marijuana-infused cookie. And earlier this month, a Denver man accused of shooting his wife reportedly ate pot-laced candy before the attack, although police say he may have had other drugs in his system. Colorado already limits THC — marijuana's intoxicating chemical — in edible pot products to 10mg per serving, with a maximum of 10 servings per package. Exact comparisons are tricky, because marijuana varies widely in potency and quality, but 10mg of THC is considered roughly equivalent to a medium-sized joint. Marijuana producers at the meeting warned that Colorado may drive consumers to use untested, unregulated edible marijuana instead of pot packages sold in stores if regulations go too far. 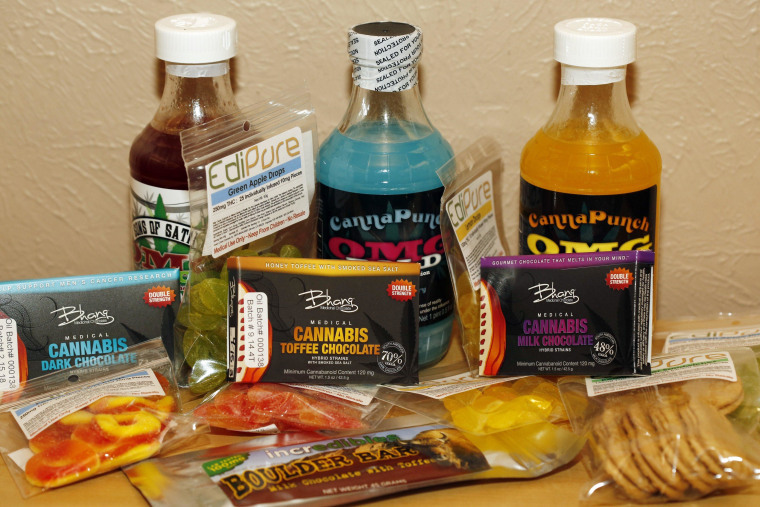 "People do have an expectation of intoxication" when they eat pot, said Dan Anglin of EdiPure, maker of many popular kinds of pot-infused candies.